The company’s former director of entertainment diversity and inclusion says the network "has a white problem"
The Golden Arches this summer is adding international fare from franchises in four countries. Content creators share tips to help marketing pros build a brand that connects with an audience. Over 200 content marketers convened at the PlayStation Theater in New York City for a collegiate-themed day of talks designed to share tricks of the trade. Here were a few highlights. As we celebrate Women’s History Month and continue to work toward a more equal playing field for women behind the scenes and depicted on-screen, here’s a brief timeline of noteworthy firsts. Be curious and open to learning a new way of managing. Venezuelan model, social media influencer, and activist, Eglantina Zingg, shares how Instagram and her remarkable upbringing in the Amazon turned her into a fierce advocate for women and girls. The views expressed on this podcast are those of its hosts, guests, and callers, and not those of Harvard Business Review. It’s chasing Netflix, but its structure has held it back. After giving my IIM Amritsar interview in Bangalore, I have been checking the IIM Amritsar portal ‘n’ number of times to check the current waiting list. Those were the days where I no more found IT job interesting. Finally, on a fine breezy evening it showed “You have been selected” and my happiness was boundless. We do even have various committees like students council, Hostel & mess, sports committee etc and Academic Interest groups like Markophilic (Marketing), FEC (Finance and Economics), Stratagem (Strategy and consulting), Hrithvi (Human Resources). The main motto of these Interest groups being to promote and develop interest on their respective domains. I being one of the four senior coordinators of Stratagem would conduct regular events in hostels, Online competitions, encouraging students to participate in Dare2compete competitions etc. Aarunya : The Annual management, sports and cultural fest of IIM Amritsar. During Aarunya participants from various B schools show great enthusiasm to participate. It is a two day event usually happening in the month of February. This is the best time for any student here at IIM Amritsar. Almost all the events are managed and conducted by our own campus students. Where in the nights of Aarunya days the whole fraternity sit back and relax enjoying the events like stand-up comedy, fashion show, dance programs. One of the great things about Aarunya is the event has been started from the second year of the institute’s establishment. 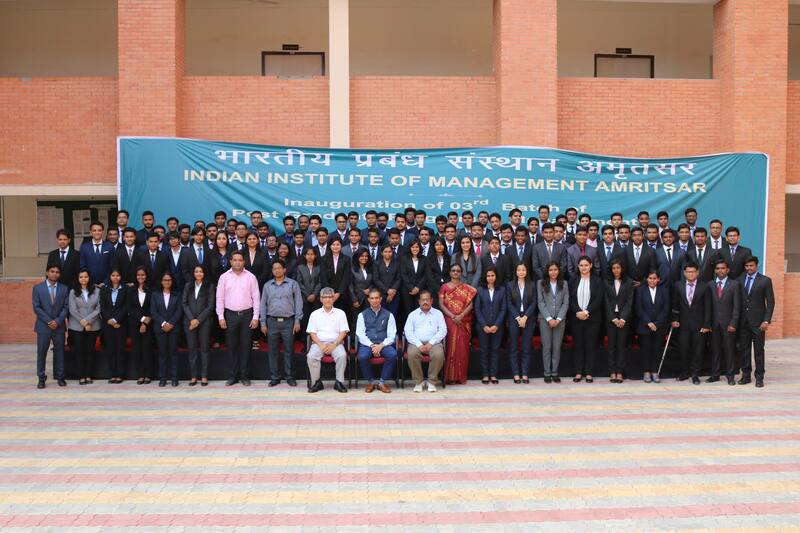 Life at ‘IIM Amritsar’: Any young student would dream of having the best student life in his/her career and IIM Amritsar doesn’t disappoint to meet your dream. I would say time flies here in our institute even amidst of hectic schedules and assignments. The current temporary hostel of our Institute is located in Ashberry Apartments a bit away from city amongst pleasant fields. See the beauty of the hostel and surroundings here below. In the Ashberry itself we do have football ground, cricket ground and badminton court. The local residents are also very much cooperative with the students and participate in festival celebrations along with the students. Especially for sports competitions we do have ‘Kritansh’ which happens parallely with academics in the months of october and november which includes both indoor and outdoor games. Academics: In the Initial days of IIM in first term, we have met with QM (Quantitative methods) subject in which we met a great professor Shovan Chowdary where Sir used to teach tough topics with such an ease where on the other hand, students had to struggle to understand the same. After hearing responses from my fellow classmates, I realized that I’m sitting with High IQ guys from all across the country. Even the courses were designed in a such a way that every aspect is covered right from Business ethics to Advanced Managerial Communication. Institute offers electives in all domains of Finance, Marketing, Operations, Strategy, Human Resources so that students can choose their interested field. Amritsar City: The City is present in Punjab State which is also known as “The land of five rivers”. In the city of Amritsar we have Wagah Border resembling the patriotism and another is Golden Temple resembling the Humanity. For the first time when I visited Golden temple I was blown away completely by the humanity and devotion of the people present there. It was such a stress buster. Later it has become a practice for students to regularly visit the golden temple and relieve the stress and spend time in such a holy place. Placements: At the end of the day, the success of the Institute and success of the students are measured definitely by looking at the placements at the end of the course. Our Institute even though it is just been three years after inception, it has been competing with other elite colleges in terms of placements. More Importantly Institute allows students to take an offer in the field they are interested in. Students accepted summers and finals in various locations in the country from Jammu to Kerala. It is not at all fair mentioning only positive things of any institute. As greatly said nothing is completely perfect even IIM Amritsar also have few drawbacks which has to be accepted compared to other Institutes. Everyday Bus ride: Since our Hostel is located away college, everyday we have to travel 45 minutes up and 45 minutes down. But I would say it is kind of a Benefit for us because the same bus journey time we have been using for reading cases and articles. Especially during exam times, it helps a lot to revise the topics in the bus journey. Hence students who do not have a habit of waking up early, now they are forced to wake up early since they might miss the bus and eventually studying in the bus. Extreme Weather conditions: The Amritsar city has extreme weather conditions. In summer season the temperature rises up to 48 degree Celsius. Whereas in winter the temperature falls down to 0 degree Celsius. So, students have to adjust to both the extremes. No Permanent campus: As said before since it is just fourth batch running currently after the Institute’s Inception, we do not have a permanent campus. Currently we are operating from Government polytechnic college, Amritsar. All the classes have been modified as required and we do have a good library and canteen for refreshments. But at the end of the day, I can say that guys – go for IIM Amritsar.